Our adventure through Borneo is not for the fainthearted. The temperatures are tropical, the humidity is no joke, and we’ll spend our nights hopping between plush boutique hotels and rugged jungle camps. We’ll begin our 13-day trip in Kuching, before heading into the jungle to kayak along rivers and rapids. We’ll go off-grid in Borneo’s Ulu Ai region, spotting orangutans and spending time with the Iban community of Nanga Sumpa, before bedding down in longhouse jungle camps. We’ll test our stamina caving in Mulu National Park, then hop to the other side of Borneo to sample city life in Kota Kinabalu and visit the sun bear sanctuary in Sandakan. We’ll go on a river safari searching for wild proboscis monkeys and pygmy elephants, and end the trip with a taste of Bornean beach life and epic sunsets on the edge of the South China Sea. Flashpackers, prepare to get wild. This sleek hotel perches on top of Plaza Merdeka Shopping Centre in the heart of Kuching with a glorious window onto Sarawak River and the city’s old-meets-new skyline. This is a hub for up-and-coming artists, whose works are dotted all around the venue. You can buy local pieces from the exhibition space on Level 4, when you’re not busy basking in the rooftop pool or exploring the bustling waterfront – right on your doorstep. This beachfront retreat is all about luxury, from its gleaming infinity pool to a private jetty where you can whisk over to neighbouring coral islands. Treat yourself at the finale of your Borneo trip with a massage at the private island spa. Then head to the Sunset Bar to watch the sea turn gold over a signature Kota Kinabalu Fruit Punch. This traditional “village stay” sits by a longhouse on the banks of Delok River, in the remote interiors of Borneo. Rooms and facilities are basic but this lovely lodge offers a rare glimpse into the Iban people’s way of life in a very remote location, as well as a chance to unplug in the rainforest wilderness. Drift off to the sound of the jungle and watch out for wild orangutans. Step off the plane into the heart of Kuching, the capital city of Malaysia’s Sarawak state, and prepare for an adventure into the depths of Borneo. No matter what time you arrive, there will be a private transfer waiting to whisk you from the airport to your hotel steeped in Kuching history – this is your home for the next two nights. If you touch down early, we recommend you head off into Borneo’s most dynamic city with your fellow Flash Pack early birds and soak up all that it has to offer. From the capital’s prime location sandwiched between dense jungle and the winding Sarawak River, you can get your first taste of the bustle of city life, and adjust to the humid tropical heat. Later, meet up with your full Flash Pack gang and get to know each other over a glass of tuak (local rice wine). Rise and shine Flashpackers! Today we’re driving half an hour to Semenggoh Wildlife Centre, a rehabilitation reserve that’s home to over 20 orphaned or rescued orangutans. If you’re lucky you’ll see these incredible apes swing through the rainforest, or even drop in for a meal at one of the reserve’s feeding zones. Next, we’ll drive 30 minutes to the village of Kampung Bangoh for an 11-kilometre paddle along the Semadang river, taking in the beauty of the jungle and dense canopy and working up a sweat tackling the river’s thrilling bursts of energetic Class I and II rapids. We’ll stop at a Bidayuh village for a swim and picnic lunch, before paddling downstream to the village of Kampung Semadang. Once we’re on dry land we’ll head back to the hotel where you’ll have the chance to relax, before heading out for a group dinner at a nearby restaurant in Kuching. Prepare to go seriously off-grid as we drive four hours east to Batang Ai National Park, stopping to explore local bazaars and tuck into lunch at one of the market towns scattered along our route. At Batang Ai, we’ll jump aboard a longboat and travel along the river for another 1.5 hours – you’ll want to pack away your book for this part of the journey as we glide past incredible views of the rainforest and junglescape, watching the tree-lined river narrow as we get closer to Nanga Sumpa. Here we’ll bed down on the banks of the Delok River at a unique jungle lodge, which sits alongside a traditional Iban longhouse. The rooms are quad-share, and come with Western-style toilets and showers, mosquito nets and fans. It’s quite basic accommodation but it’s all part of the jungle experience in this remote, off-grid location. We’ll share a dinner of chicken, fish, rice noodles and fresh jungle vegetables, before drifting off to the sounds of the jungle’s nocturnal choir. Today we’ll head out just after dawn and follow a local guide into the thickets of the rainforest to search for orangutans. Afterwards, we’ll amble back to the lodge for breakfast, pack up our gear and board a longboat for a 30 minute trip upstream to Lubok Kasai. After checking in to tonight’s jungle camp and lunch at one of Sarawak’s most beautiful riverside spots, we’ll follow a expert into the forest where it’s time to forage for your own dinner. From wild ferns and bamboo to ginger shoots, we’ll gather up a crop of fresh jungle delicacies. Afterwards, we’ll head back into the rainforest in search of more wild orangutans, passing the Lalang River and Enseluai waterfall – perfect for a dip if you’re feeling the jungle heat. Come evening, we’ll feast on the rewards of our forage and enjoy a sundowner like no other in the heart of Borneo’s rainforest. Wake for an early morning jungle walk, then it’s time for breakfast and boarding the longboat back to Kuching. If you’re yet to commit the spectacular beauty of the jungle to pixels, this is your chance to put your photography skills to the test as we glide downstream through the narrow jungle waterways along the Ulu Ai. After three days spent deep in the rainforest, the evening is yours to explore more of Kuching’s city life. We’ll return to our trip’s first hotel, perfectly located for an exploration of Kuching’s diverse restaurants and vibrant watering holes. Take an evening stroll along the picturesque esplanade then delve into the city’s tasty Sarawak-style cuisine. To eat like a local try fried tapioca leaves, indigenous dishes such as ayam pansuh (seasoned cuts of chicken cooked inside bamboo stalks), or a hearty laksa; rice noodles cooked in a spiced coconut milk and prawn broth. Today we fly 1.5 hours northeast to the incredible expanse of Gunung Mulu National Park. Flanked by a trio of rugged mountains – the Mulu, Api and Benarat – this World Heritage-listed park is home to huge jungle plants, monkeys, deer, Malayan sun bears, bats and the intriguing hornbill. We’ll check in to our park chalet and set off on a three-kilometre walk to Deer Cave. The world’s biggest cave passage, Deer Cave has a spectacular main chamber reaching 122 metres high and leading onto Borneo’s Garden of Eden – a pocket of lush green plants bathed in sunlight that streams through an opening in the roof. Afterwards, we’ll head to nearby Lang’s Cave, home to impressive stalactites and stalagmites, bats and cave snakes, and then back to Deer Cave for the awe-inspiring sight of over a million bats flying from the depths of the cave in a mass exodus for their nightly feeding forays. Today’s your chance to tick adventure caving off your bucket list. We’ll venture deep into one of Mulu’s less-visited caves and get hands on and mighty grubby as we crawl, climb and squeeze our way through rock formations and crevices, hopping over streams and wading through underground rivers. Mulu’s immense caves are always challenging, so expect to work up a sweat on this exhilarating underground clamber. After an adrenaline-fuelled morning, we’ll head back to our park chalets for a quick lunch and change of clothes, before exploring a nearby village that’s home to a community of Sarawak’s indigenous Penan tribe. Afterwards, the evening is yours to kick back and relax. Swot up on your local knowledge at the Mulu Discovery Centre, browse local handicrafts at the gallery, or pull up a seat on the cafe patio for an epic jungle sunset. After a quick breakfast, we’ll board a longboat and sail up the Melinau River to Wind Cave. We’ll pass through the mighty King’s Chamber at the belly of the cave and then feel the burn as we climb 250 steps straight through the rainforest to the entrance of our next stop, Mulu’s Clearwater Cave, which, at 107 kilometres, is the longest in the whole of Asia. An underground river runs right through Clearwater – swimming isn’t permitted inside the actual cave, so we’ll take you upstream to an idyllic pool shaded by rainforest, for a refreshing dip and picnic. Later we’ll say farewell to Mulu and hop on a flight to Borneo’s Kota Kinabalu, the capital of Malaysia’s Sabah state. Check in at your boutique hotel, a magnificently restored Colonial building in the city centre, then you’re free to explore Kota Kinabalu’s eclectic dining scene and lively bars. Rise early Flashpackers, we’ve another fantastic day ahead of us. First up, we’ll head to Kota Kinabalu airport to fly 45 minutes to the city of Sandakan. After touching down we’ll head to the Sandakan Memorial Park, where serene gardens and a small museum pay tribute to Australian and British soldiers held at the city’s prisoner of war camp during World War II. Then we’ll hop on a boat and glide along the Kinabatangan River to a luxury rainforest lodge, our home for the next two nights. Once we’re all checked in, take to the river once more for a safari along the banks of the Sukau Rainforest. Keep your eyes peeled: you’re likely to catch a glimpse of orangutans and proboscis monkeys, crocodiles and hornbills. Later, we’ll head back to the lodge for a group dinner, then you’re free to soak up the incredible jungle setting. We’re kicking things off early and heading to nearby Pitas Oxbow Lake. There are 200 different species in this region alone, from hawk, heron and hornbill, to colourful kingfisher and the rare oriental darter. After breakfast back at the lodge, we’ll head out to a rainforest replanting area to see the laudable work being done to regenerate destroyed orangutan habitats, before setting out for another afternoon of exciting wildlife spotting. There’s an animal extravaganza to be seen from our unique position on the river, so you’ll want to keep your camera handy for the incredible birdlife, as well as monkeys and orangutans swinging high up in the canopy. Once we’re back at the lodge, take to the sun deck to kick back on a lounger surrounded by towering trees, enjoy a stroll along the leafy boardwalks, or grab a refreshing sundowner at the jungle restaurant. Enjoy a slightly later start this morning before travelling back along the Kinabatangan River and to Sandakan, where we’ll browse the colourful local markets then check in at the MY Nature Resort, a spread of luxury eco-chalets next to the Sepilok forest reserve, one of the oldest tropical rainforests in the world. After lunch we’ll head to the Borneo Sun Bear Conservation Centre, a short drive away and home to 44 rescued Malayan sun bears – the world’s smallest bear and a species under threat from poaching and deforestation. Next up is the famous Sepilok Orangutan Rehabilitation Centre, your last chance to see these magnificent apes up close in the wild. The centre’s reserve is now thought to be home to over 200 wild orangutans. Later, we’ll grab a 45-minute flight from Sandakan to Kota Kinabalu, where we’ll check in at our beachfront hotel overlooking the sands of Tanjung Aru and the sparkling South China Sea. This is your penultimate day in Borneo and after a non-stop schedule, it’s time to slow the pace. Our hotel is the perfect place to enjoy Borneo’s beach life so pull up a sunbed, submerge yourself in the hotel’s outdoor infinity pool, or book yourself into the spa for a little end-of-trip pampering. If you have itchy feet, the retreat’s marina offers a packed menu of water sports, including kayaking, or jump aboard the shuttle boat to explore and snorkel the clear blue waters of nearby islands and the corals of Tunku Abdul Rahman Marine Park. Come evening we’ll gather at the Sunset Bar to toast our epic adventure with cocktails, followed by one last group feast at an al fresco hangout. Expect delicious fresh seafood, grilled meats marinated in tasty Malaysian sauces, Asian barbecue skewers and nasi lemak (Borneo’s take on coconut rice). 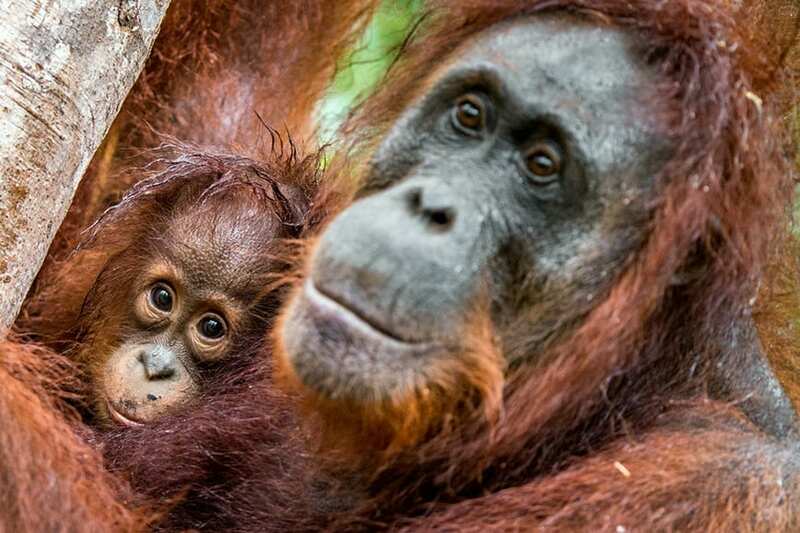 The time has come – it’s our final day and time to say goodbye to Borneo. It’s over to you to organise your taxi to the airport and depart as you please. Wherever you’re headed to next, you’ll be sure to have made memories you’ll never forget. You’ve kayaked along the rapids of the Semadang river, travelled deep into Iban heartland in search of wild orangutans, and bedded down in jungle camps and rainforest lodges. You’ve sipped sundowners under the jungle canopy, hitched a longboat along the Ulu Ali and travelled deep into Mulu National Park. You’ve marvelled at over a million bats streaming from Deer Cave at feeding hour, spotted monkeys, sun bears, apes, wild birds and more deep in the jungle, watched an epic sunset with the sand between your toes at Tanjung Aru, and successfully conquered the crevasses of a vast rainforest cave. We’d call that a bucket-list adventure done well! Fly into Kuching International Airport (KCH) and fly out of Kota Kinabalu International Airport (BKI). Please try and time your arrival before 2pm on Day 1. For the first few nights of this adventure, the accommodation is more basic due to the remote jungle location. One the other hand, it really offers the best way to experience and get up close to the lush rainforest landscape. Prepare for heat, humidity and a fair amount of mozzies (come armed with plenty of repellent). To balance the books, we finish in luxury at the resort on Tanjung Aru beach.